If you want to find a local tradesman, you use the Yellow Pages. Well, that’s not strictly true – very often you have your own network of tradespeople; a trusted plumber, a good builder, a gardener who knows the difference between a plant and a weed. 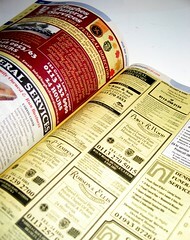 But if you need someone out of the ordinary - outside your personal network - the Yellow Pages are invaluable. But what if you are in an organization, and want to find an experienced practitioner to solve your business problem? Where are the corporate Yellow Pages? If you need someone with expertise outside your personal network, very often you have no means of finding them. Firstly, it is entirely voluntary. Nobody forces you to enter your details – you do so because it improves your connectivity. This avoids some of the issues of data protection, and employee secrecy, as every detail in Connect is volunteered; the only exception being your email address and phone number, which are taken from the company phone book. And despite being voluntary, the majority of the computer-enabled staff have registered. Secondly, it is a register of experience. It doesn’t look to identify the experts, but allows people to register those topics where they have experience. Knowledge is often very widely dispersed, and not always held by the experts. Connect lets you cast the net wide, when looking for help and advice; beyond the usual corporate suspects who will give you the usual corporate answers. Thirdly it is a mix of structured and unstructured information. Connect exists in order to help you find people with expertise. So when you register your details, fields like Expertise and Location are selected from a pre-populated list. There is the option to add new topics to the list, but most people will choose those topics which most represent their experience. So if you are looking for someone with legal experience, for example, they will each have selected the “legal” tag. This contrasts with other systems such as MySpace (the personal pages section of SharePoint) where you type in the expertise and location yourself, rather than choosing from a list. So a lawyer in the Basingstoke Head Office might describe their expertise as Layer, Law, Legal, or Counsel, and their location as Head Office, HQ, Main Street, or Basingstoke. Other fields in Connect are free form. You can also fill in a free text field to describe yourself however you like, which can be searched using a free text search. This is where you put in the more esoteric pieces of experience, that don’t sit on the list. For example I was teaching the same KM course in Trinidad a couple of years ago, demonstrating Connect, and I asked the class “Has anyone got a topic youi want me to search for?” A guy at the back called out “Microwave Towers”. He was putting a series of microwave towers in Trinidad to communicate with a remote base, and wanted to find others with experience in the company. So I did a free text search, and came up with one name, Stanley Patillo. So I said “There you go – someone else with experience” and he said “I AM Stanley Patillo”. Well, at least he knew there was nobody else to help him! So how do people use this wonderful system? Firstly you can use it to identify people to invite to a Peer Assist. Peer Assist works best when you invite people with a broad diversity of experience, and Connect allows you to find people from all over the company, not just in your personal network. Secondly, you can build your own advisory panel. Identify the 20 people with the most relevant experience, and set up an email Q&A, a telephone conference, or an online chat. Finally you use it to develop your own profile, so people can start to use you as a source of experience, and so extend your reach and influence within the company. When I asked the participants at the end of the course, what they though were the most useful KM tools in the BP KM toolbox, Connect was the one they all voted for. It’s simple, it’s elegant, and it allows you to find “the people who know”. I would recommend a similar Yellow Pages for any large dispersed organization where finding knowledgeable staff could be of value.